Want to order our good beef? Click here to get meat delivered through the winter. There’s a 1,200-pound animal charging toward you, hooves thumping the ground, huge head swinging in a chin-splitting uppercut, huge nostrils flaring. You fly when that head hits you. You land in a heap and remember: your physical prowess is not what got you to the top of the food chain. Everyone I’ve spoken to who’s been charged by a mama cow sees this scenario flash behind their eyes. It’s an ancient, elemental fear. It’s one reason why our ancestors exterminated the wooly mammoths. And it makes the ancient domestication of cattle seem like a miracle. I once worked on a seed farm, where we bred new crop varieties, and the owner would often say: “Plant domestication is an ongoing project.” On that seed farm, it was easy to see that he was right. Crops continually evolve in response to changes in soil tilth, climate, genetic mutations, and human tastes and technologies. Animal domestication is an ongoing project, too, one that has been evolving for at least as long as our partnerships with plants. It’s not too difficult to imagine the original domestication of dogs: a courageous pack of the common ancestors to dogs and wolves started hanging out near human cookfires, eating all of our waste (know what I mean?). Through thousands of years of selective breeding, we created the perfect hunting companions and camp guards. Dogs were an extension of our senses. How about cattle? Perhaps a mama cow died in childbirth, and her calf was discovered and raised, painstakingly, by humans, who then took more calves, over and over, breeding and breeding for docility. After centuries of selection, our ancestors had created another animal partnership that expanded human power: cows gave humans super-strength and an extended digestive system. Cattle pulled plows across the first broad fields of early agriculture. Cattle eat inedible (to us) grass from the vast prairies and convert it into edible meat and milk (and blood, which still sustains several nomadic African herding peoples). Recall the desperate Celts described in my previous post, who starved trying to eat grass. We have never eaten grass, we have long eaten the ruminant herbivores, who themselves eat grass. Domesticating our own ruminant herbivore allies saved our ancestors incalculable time and risk. With cattle as allies, we could focus on creating elaborate stories, hierarchies, and tools; we could grow broad fields of domesticated grass that had nutrient-dense seeds, like wheat; we could develop, for better and worse, agriculture, civilization, and money (Cattle were one of the original currencies). Mama cow with newborn Rihanna. But it’s easy to forget this wonderful ancient partnership when a 1,200-pound mama cow is charging at you, swinging her head in an uppercut. When that happens, you just run. And then afterwards, you exhale the autumn air slowly, silently thanking those ancient people who domesticated cattle. Because mama could have killed you, but she didn’t. She doesn’t actually want to, because she was bred not to. She just wants to protect her calf. 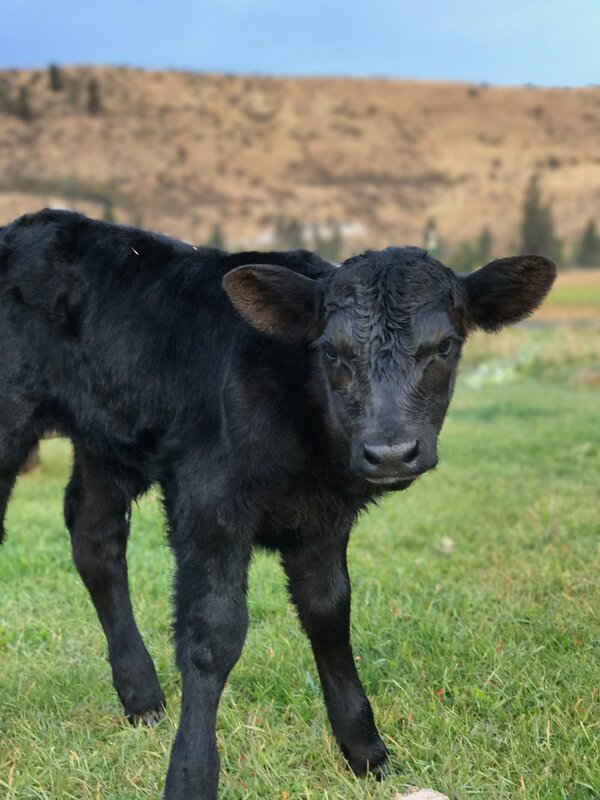 She can’t know that you love her calf, too, a little black-furred cutie on spindly legs who needs an ear tag and vaccination. (We are still formulating our opinion about whether to vaccinate our herd… but for now we want to minimize risk.) The adorable little animal who curls up next to her mama at night, gambols around paddock testing her legs during the day, and will eventually birth a dozen or so calves of her own. She is the epitome of innocence. She smells like buttermilk and rich soil, mixed together. To watch her live is to contemplate the wonder of life begetting more life. To watch her is to wonder: are we doing the right thing? One one level, yes. As farmers, we are up to the challenge of keeping her healthy, comfortable, and productive. We have good help and mentorship, and plenty of grass. But on another level, doubt creeps in. Should we humans still be raising cattle? Many conscientious people advocate abandoning our partnership with cattle altogether. “They are part of a wasteful and corrosive production system,” one might say, “that exploits innocent animals for indulgent products (meat and milk) that we can do fine without.” These arguments are very compelling, at first glance. But is raising happy, comfortable cattle truly exploitation? If there were no beef or dairy industry, there would be hardly any cattle. If you couldn’t make a living raising farm animals, who would do it? Consider how populations of wild herbivores (bison, elephants, elk, etc.) have collapsed in the last 200 years, while the population of cattle has steadily grown. If you can buy the idea of a “selfish gene,” then cows’ partnership with humanity is paying off, big-time. So when I watch Rihanna the calf standing beside her protective mother, both my emotional and rational sides are convinced that they should be alive here on earth. I consider a question: would you rather live a comfortable, social, well-fed life with an unknown time limit, or not live at all? I know that I would choose the former. In fact, that doesn’t sound too different from my actual life. Aren’t we all born subject to contracts that we never consciously signed? Couldn’t any of us die at any moment? Over the last few thousand years, the human population has grown larger and larger (and larger) because of our ability to harness forces more powerful than ourselves. Stone tools, fire, cattle, metal, gunpowder, written laws, science, oil: we use them so well that we become a dominant force of nature. And in the last hundred years, our use of oil has given us nearly absolute power over some of our eldest tools, cattle and other domesticated animals. You know what they say about absolute power. We can transport as many cattle as we want, and however much feed we want, across thousands of miles. We grow millions of acres of genetically-uniform grass clones (corn) and truck their seeds to feedlots where thousands of cattle cramp together, injected with growth hormones, bodies inflamed by the equivalent of an ice cream-only diet, beside enormous lagoons of concentrated manure that leeches into groundwater instead of fertilizing fields. From a purely logistical perspective, the modern beef industry is a triumph. But from an ecological perspective, it is a gross aberration. It is a drastic imbalance and a moral abuse. Cattle feedlots and other factory farms are for-profit torture regimes. The modern beef industry is a breach of the ancient covenant between humanity and cattle. How do we change the system? Nobody knows the full answer to that question, but one thing is clear: It is easier to convince meat-eaters to eat clean, healthy, humanely-raised meat than to convince them to stop eating meat altogether. Well-raised cattle are also a crucial tool for the next era in humanity’s evolution. While greenhouse gases cause the oceans to warm up, we should utilize every strategy with promise to store carbon in solid form. Soil is the world’s largest carbon sink, and rotational cattle grazing can build soil. The more I learn about cattle, and the more time I spend with them, the more I love them. I am increasingly aware of how important they have been for humanity. I look at little Rihanna the calf, nursing at her mother’s side, and I see a powerful ally that can help to save us, if we treat her well. This concludes our "When the Cows Come Home" trilogy. Click here to read Part 1, or here to read part 2.